We peeped out from under our umbrellas like excited kids while our Troll Car to Briksdal Glacier bumped up the mountain. It was pouring down with rain but, unusually for me, I didn’t care. To my right a waterfall was tumbling majestically down the mountain, roaring with frightening force and power. To my left I could see the icy blue tip of the glacier coming into view and I was filled with another thrill of excitement. OK, I was soaking wet but it was worth every drop of rain to see the glacier and the milky blue water below. I was in Norway with P&O Cruises to celebrate their new ship, Iona, launching in 2020. 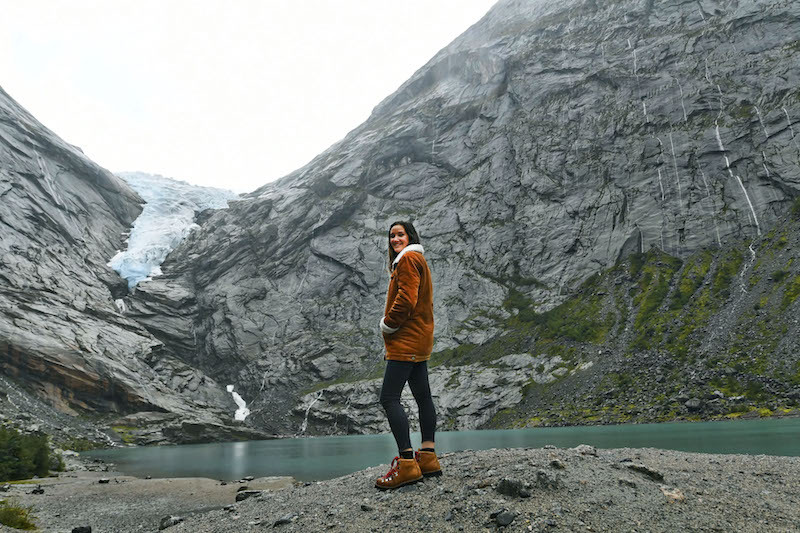 I’d been invited to check out some of the shore excursions available to cruise passengers in the Norwegian fjords and taking a Troll Car to Briksdal Glacier was an absolute highlight for me. We were making our way to the the glacier on a Troll Car, a small buggy seating 7 people, which picked us up from Brikstal and drove us to Briksdal Glacier. 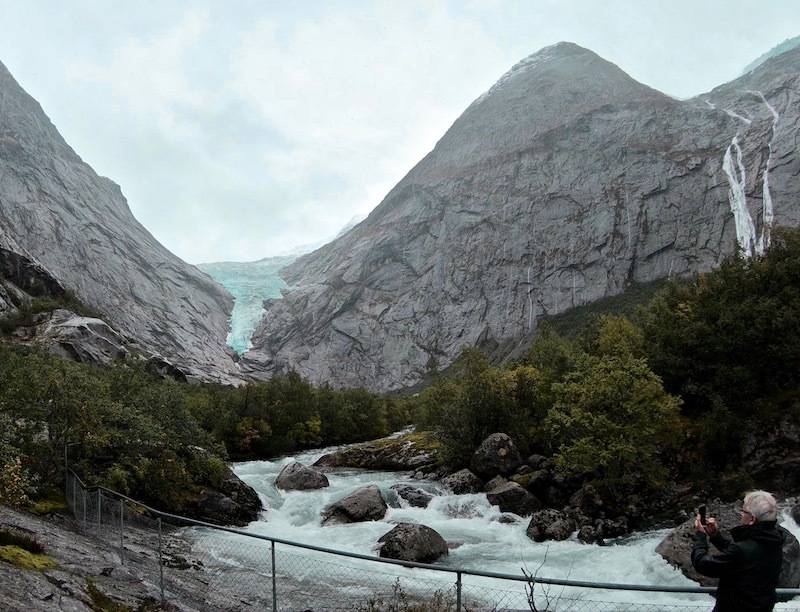 You can also hike to the glacier and a popular walk is a 3km hike from the Mountain Lodge to Briksdal Glacier. If you’re able to walk and the weather is on your side then I’d recommend walking. The views on the way up are breath-taking and reaching the glacier feels like even more of an achievement. But if you’d like a simpler way to reach the glacier then the Troll Car is a fun, easy and accessible way to get there and the round trip takes about 1.5 hours. The cars run regularly and you get plenty of time at the glacier before returning. The Troll Cars drop you off near the glacier (about 700 meters away) and then it’s a short walk on fairly even ground. 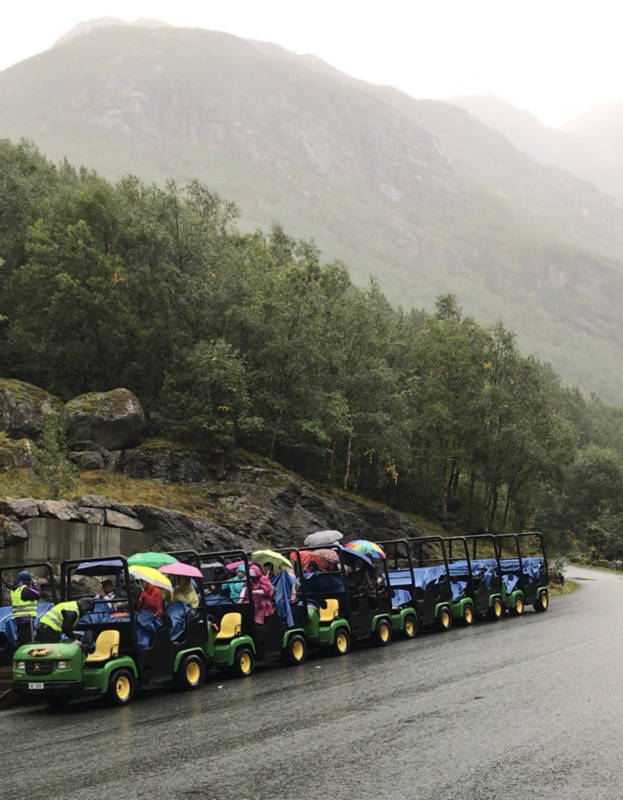 Travel Hack Tip: It’s worth noting that the Troll Cars don’t have a roof so be sure to pack an umbrella or a sun hat – or both because in Norway you really might get blazing sunshine followed by heavy rain! Brikstal Glacier is part of the famous Jostedal ice field, the largest in continental Europe. The glacier soars up to 1,200 meters and has a beautiful blue hue. It looks like something from a Disney film – you can almost see the water crashing into the valley below and it’s like Elsa herself has cast out her magical powers to freeze the water as it falls. Yes, that’s a Frozen reference for anyone who hasn’t had the pleasure of watching it 50 billion times. There’s an icy chill but the air is so fresh and clean and you’re bound to be distracted by the beautiful scenery that surrounds. Like everywhere I’d visited in the Norwegian fjords, standing at the bottom of the glacier made me feel so small. Everything is just so big and momentous, and you really do feel like you’re stepping back into a pre-historic time. You might be surrounded by roaring waterfalls but it’s unbelievably peaceful and time stands still as you admire the epic view. I’m sure people have been visiting this spot for hundreds of years and staring in awe at Briksdal Glacier while admiring how beautifully blue the water is and wondering if they’re brave enough to dip their toes into the icy water. 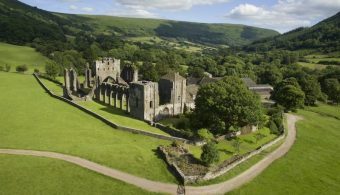 Farmers have been taking tourists to this very spot for over 100 years and bringing them here in a horse and cart! The Troll Cars replaced the horses in 2004. I visited Briksdal Glacier as part of an excursion with P&O Cruises as this excursion is available on many of their Norwegian cruises. My trip was to celebrate the launch of Iona, their new flagship launching in 2020. You can read about my kayaking and rib boat ride through the fjords here. I recommend wearing lots of warm layers when taking the Troll Car to Briksdal Glacier. 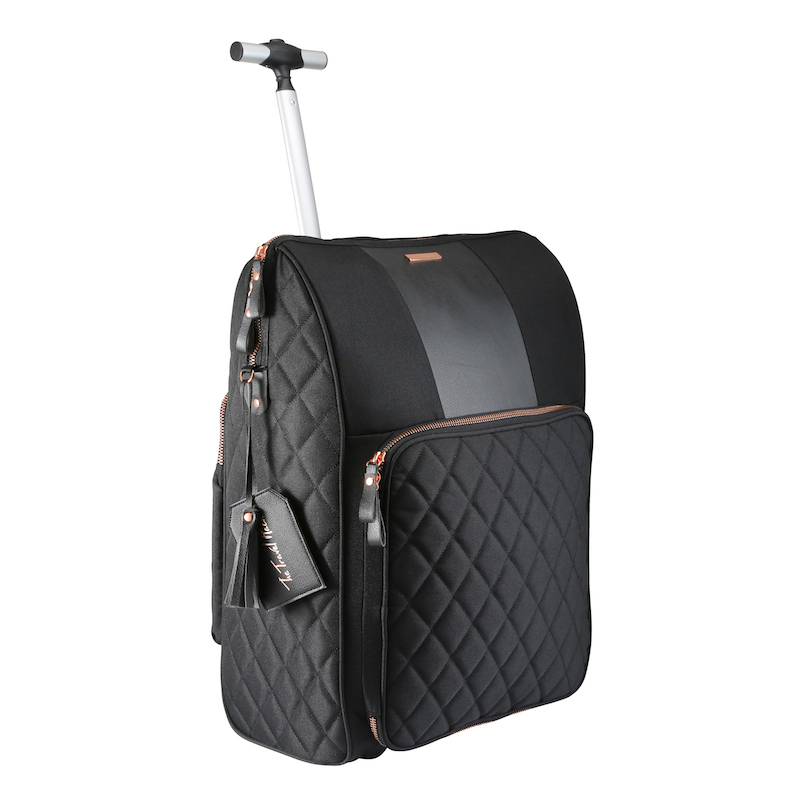 The weather can turn quickly in Norway so make sure you have a small backpack for all the clothes you’ll probably be taking off and putting back on! Heavy hiking boots aren’t necessary but lightweight walking shoes are best. I like the Merrel Siren Q2’s. Waterproof trousers are a good idea. I like the thin, lightweight ones you can pull on over your normal trousers or shorts so you don’t need to spend all day wearing waterproof trousers if you don’t need them. I’d then wear a t-shirt and a long sleeve top and take a warm jumper and a waterproof jacket.